It is far too easy to let seasons and holidays come and go without truly celebrating, with gradual temperature and landscape change as the only indication that the year has progressed. Time passes quickly and without marking moments in time, it can accelerate even more quickly. In years past, I have given little acknowledgment to what makes certain times of the year special, with the excuse that “life gets in the way”. 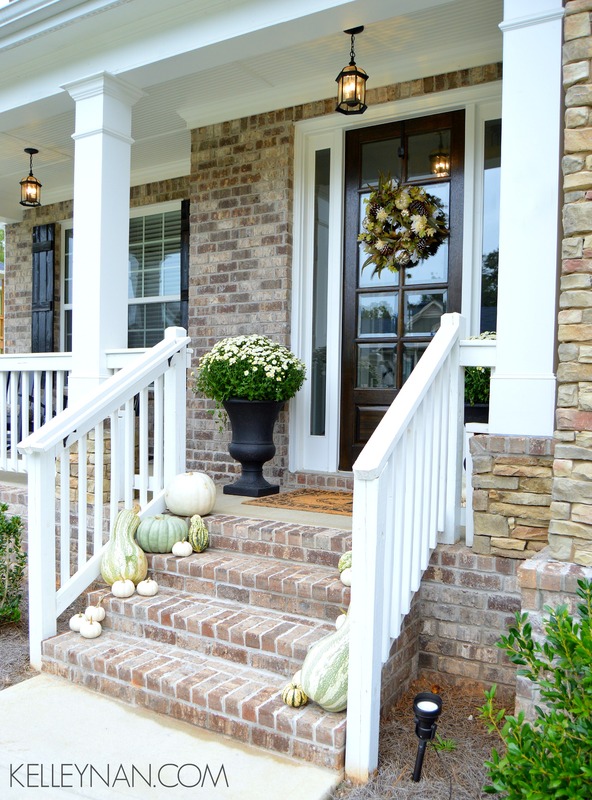 This year, I was determined to make an effort to make it feel like fall in our home, despite the hot September temperatures, instead of bidding it farewell after realizing it had already passed. 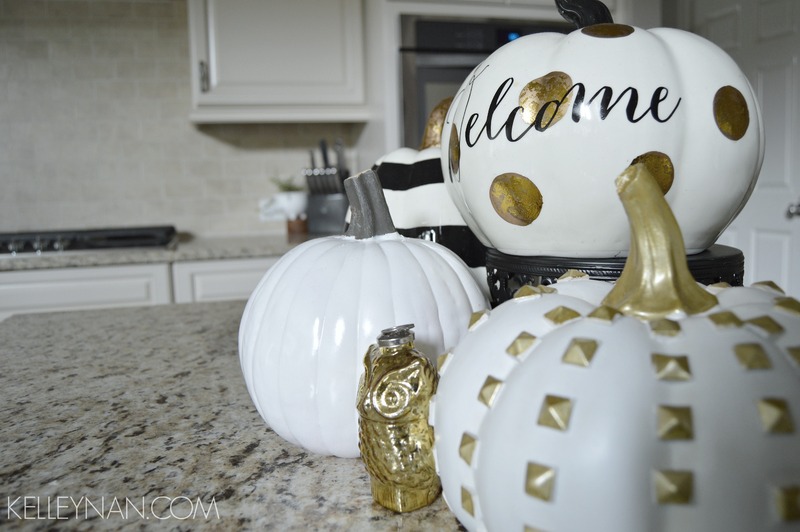 This is our first fall in our new home so while I didn’t want to get too extreme in my decor, I was ready to bring on some subtle transitions to welcome the cooler weather and this magical time of year. As you tour, please feel free to leave any questions you may have in the comment box. Without further adieu, I would like to welcome you to our fall home! Our landscaping is still in the “baby”, post-construction stages. We plan to start planting some trees later in the fall. We have a small entry that leads into a fairly open floor plan. To the left is our formal living room. 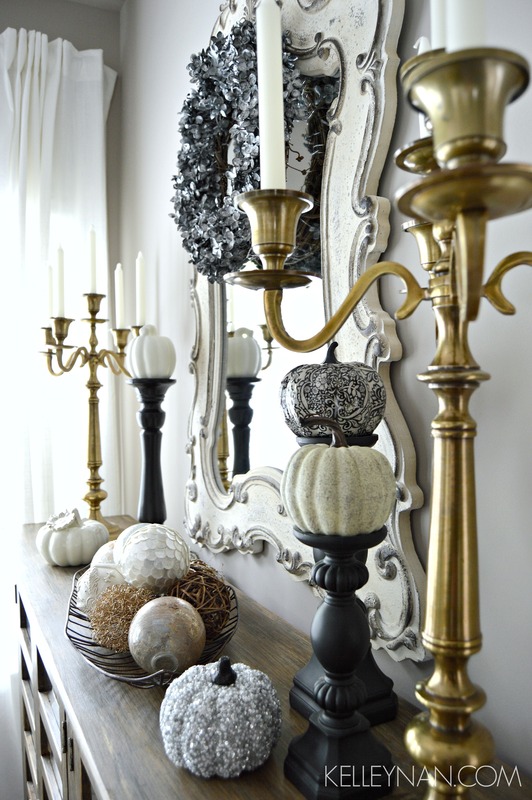 Its an eclectic mix of metallics and some handsome darker tones. 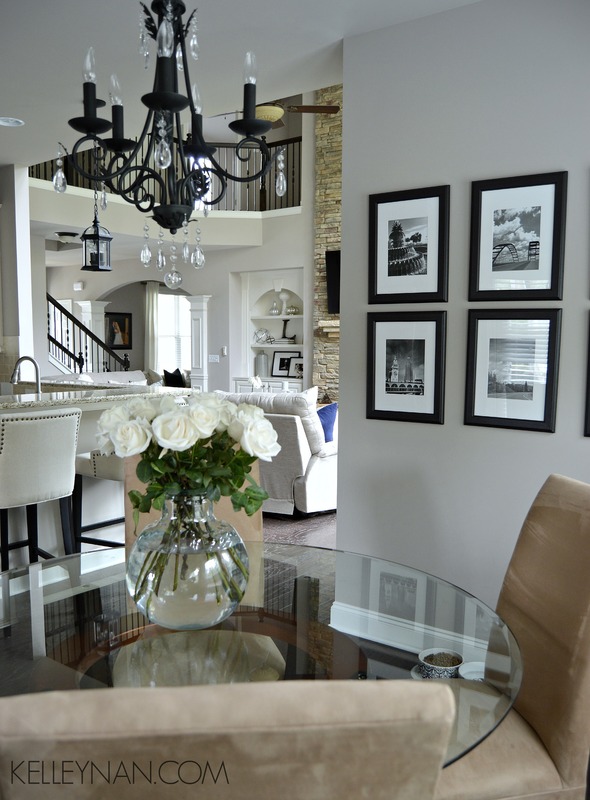 This room is a combination of classic with a little modern flair. 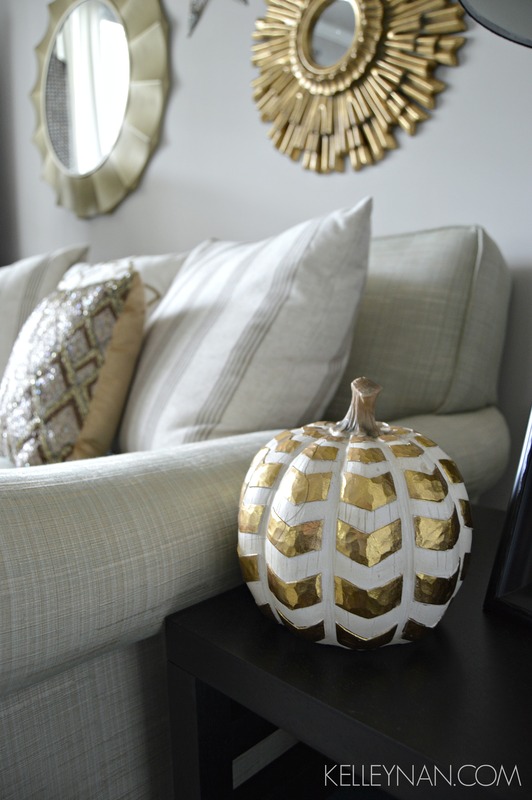 I added a few white/gold pumpkins in here but kept the fall decor minimal. Peering across the entry, to the right is our dining room. I don’t tend to do too many DIY activities, but since I didn’t have immediate access to orange pumpkins, I picked up some in the orange variety and spray painted them white with glossy paint I had on hand. This was my absolute favorite room to decorate. I cleared my peacock place settings and built a metallic tablescape. I won’t spend much time on the specifics as a full blog detailing how I created the table can be found here. Next up is the great room aka our TV-binge-watching-Heaven. If we aren’t on our back deck, this is where you will find my husband and I relaxing. This summer, the room was filled with ice blues and some coastal inspiration. 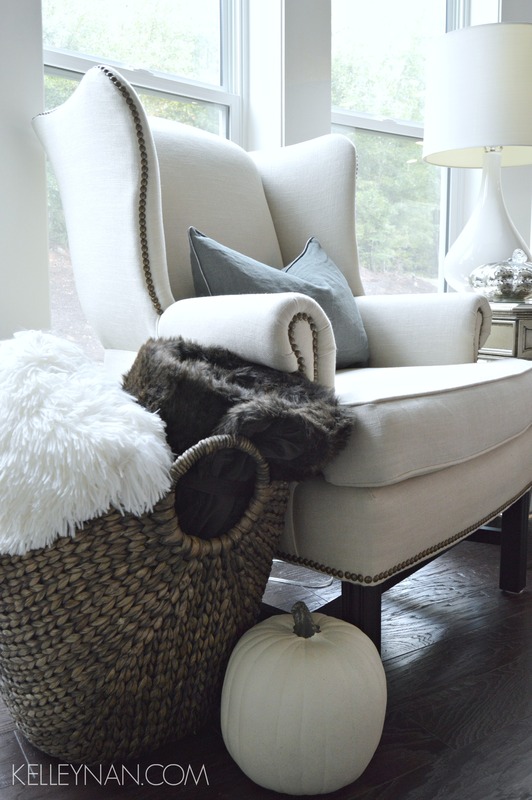 I transitioned to fall by adding a few neutral pumpkins and natural fall elements, and switching my pillows and blankets to navy and gray with rich textures (think lots of fur and fuzz). 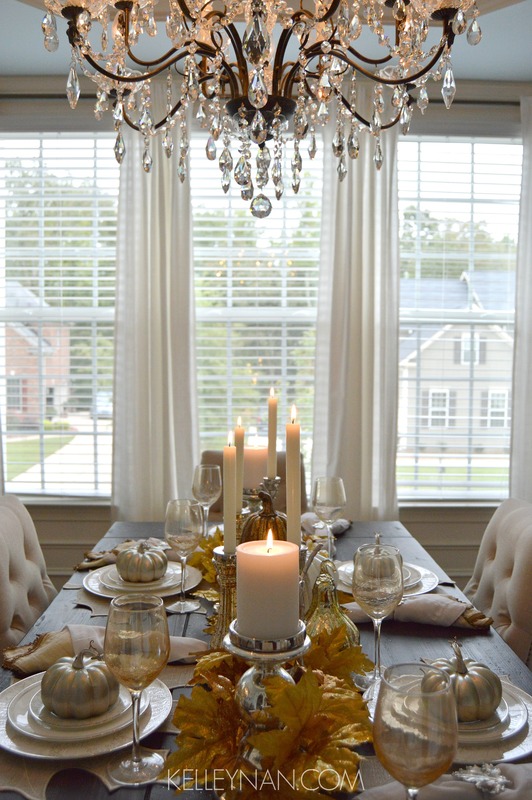 You don’t have to use warm colors to evoke a cozy fall atmosphere. 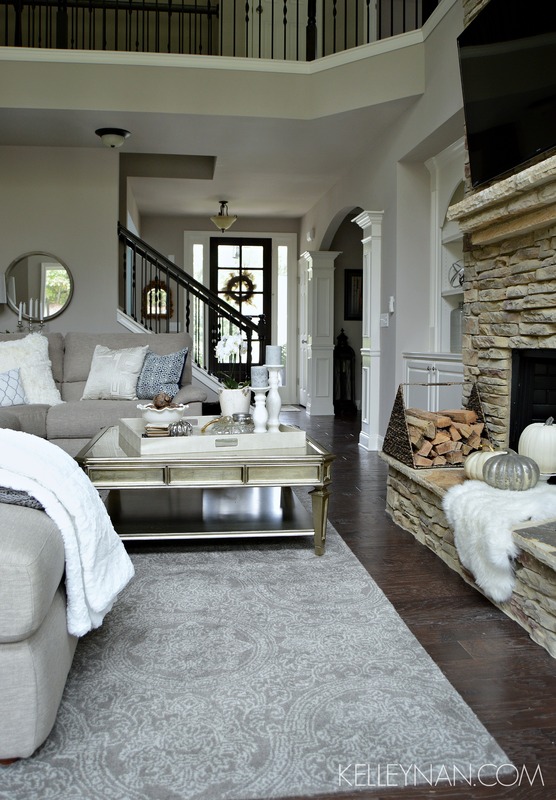 Layering with blankets and pillows enhances the cozy feel of this room while still keeping it clean and “dressed”. 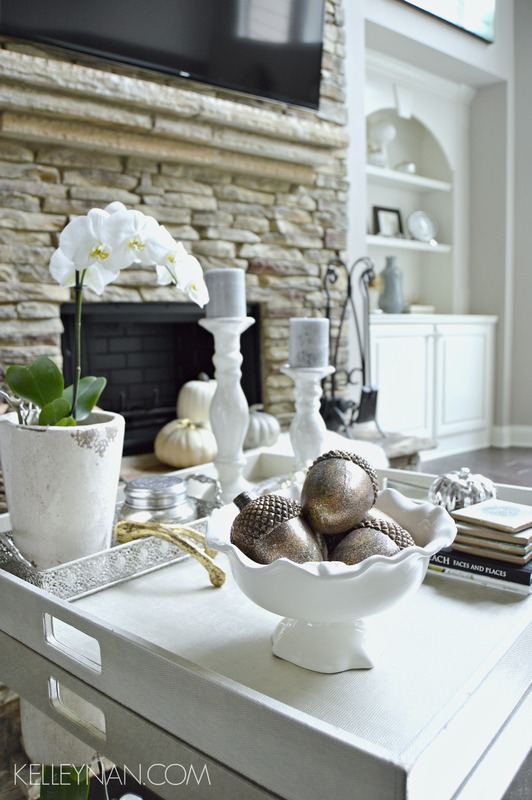 The oversized tray on our coffee table serves as a focal point of the room. 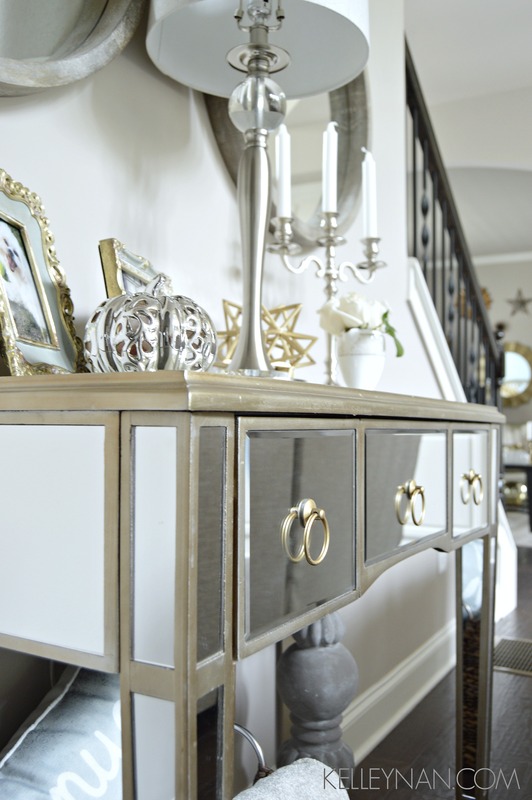 Even mixing silver, gold, blue, gray, white, brown, bronze, etc., the overall appearance compliments neutral. I am a huge fan of mixing metals; hopefully this demonstrates that there is no need to fear a little diversity in your color mixing. 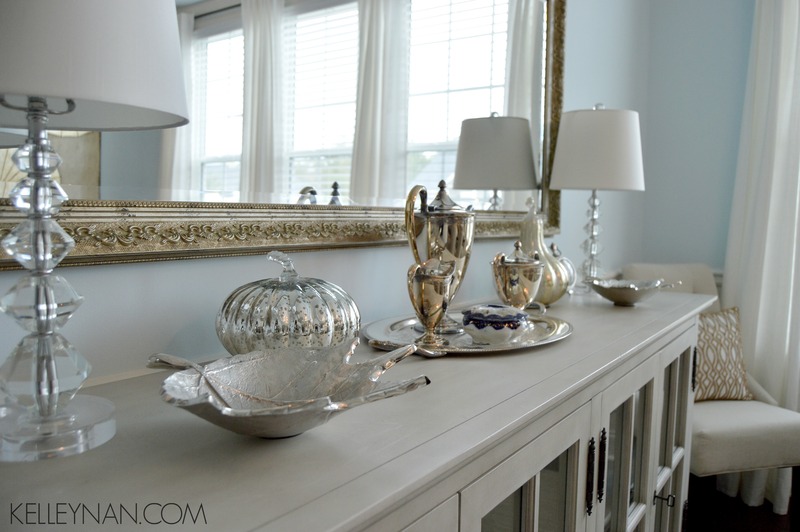 Note: For tips on how to style a tray/coffee table, visit my previous blog post. The kitchen and breakfast nook are open to the great room. I carried the gray/metallic decor theme over to the breakfast nook, but changed it up a little bit in the kitchen and use black instead of navy as my dark color “punch”. 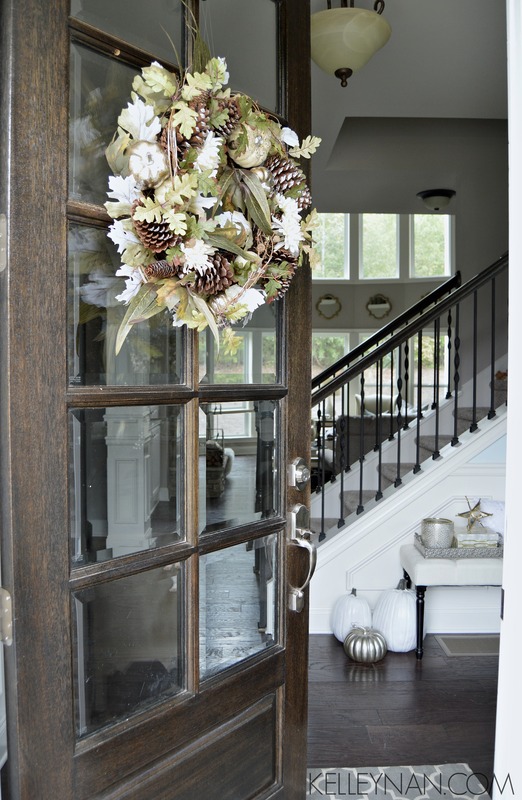 This charcoal hydrangea wreath was also a DIY. The blooms were attached to black stems intended for Halloween. I picked up several for 90% off regular price. 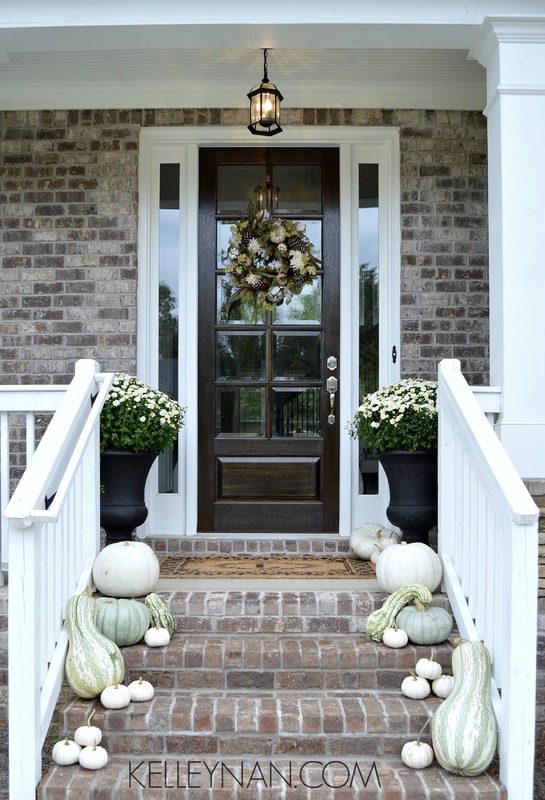 Pillar candle holders make great elevators to create height, not just for pumpkins but for year-round decor. Here is another example that you can mix patterns, colors, textures, and finishes. Since the great room is separated by a partial wall, I feel I can get away with the bold black in lieu of the navy. The breakfast nook acts as a balance of the two. Thank you for stopping by our home! When the last leaves have fallen, I hope you will stop by again for a Christmas tour. 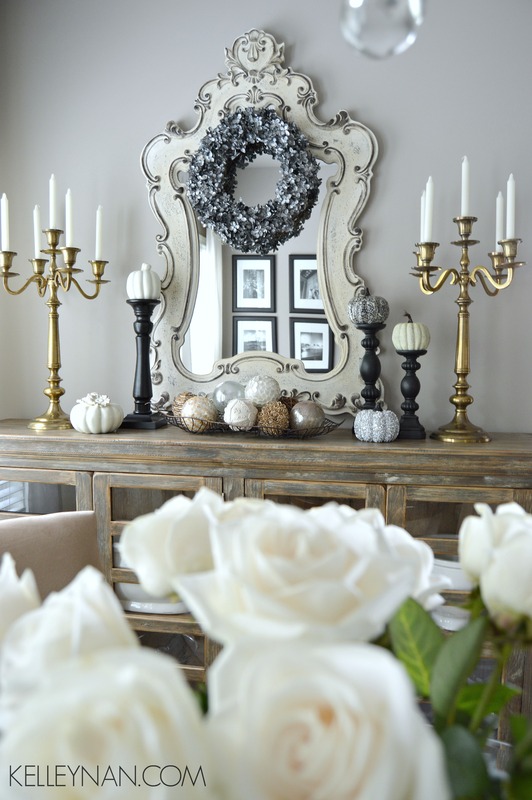 Chances are, you will see much of the same decor, just used in a different way. You can find me on Instagram @kelleynan to follow me through my home’s transitions over the next few seasons. Just perfect! Thank you for such an beautiful tour of your welcoming home! Every detail is amazing! You are a true talent!! Fabulous photography and so many rich elements – I love the sophistication! Well done my friend!! Tamara- thank you so much for your kind words, my friend! You are such an inspiration! What color is the upstairs ceiling? Does it match the coffered ceiling? LOVE LOVE LOVE LOVE this home. You have done an amazing job. I can’t not find one thing I don’t like about your home. You have a great talent. You ROCK!!!!! Angela, thank you so much for your kind words!! What a wonderful start to my day! I loved everything about your house! What color grey did you use on the wall in the kitchen and throughout? Thank you, Shannon! The kitchen and breakfast nook are Perfect Greige and the rest of the house is one shade lighter in Versatile Gray- both Sherwin Williams. 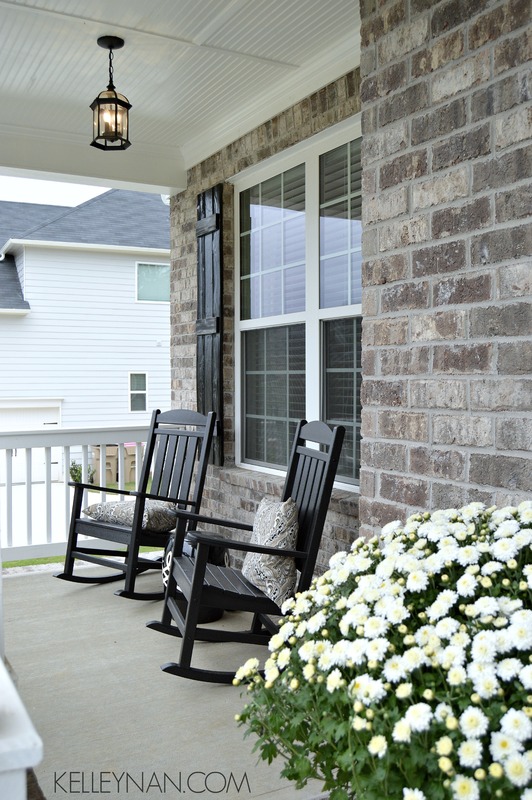 Love your home! Beautiful!! I was wondering where your dining chairs are from? Thank you! I found them at World Market- the Lydia. I absolutely love your home! Is that the salvaged wood trestle table from restoration? I just ordered the table and looking for chairs. I love how your chair look with the table. I went on the site where you purchased yours. My question is which color did you choose for your chairs in dining area? I enjoyed this so much! love starting my day looking at such beautiful things! Your style is impeccable! Thank you so much, Jessica! We ordered them off of Amazon in the color they are. They are a polywood so they are supposed to hold up through weather conditions. The black candle stocks have been accumulated over time. I think some came from World Market and some from HomeGoods. Thanks for the reply! Looking forward to seeing more of your lovely home. Gorgeous home! I simply adore your style. I would truly appreciate your insight and guidance. 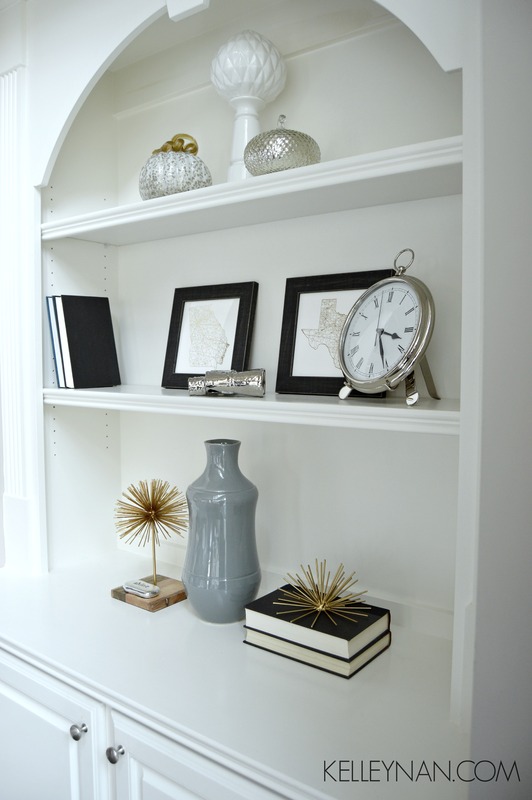 My family and I recently completed construction of our new home and your style is right in line with all the things I love – neutral tones, metallic and pops of color. I would love an opportunity to work with you in the future. Hi, Cassandra- thank you so much for stopping by and congratulations on your new home! I would love to chat more. You can submit a contact through the blog to imitate an email. I look forward to hearing from you! Thank you!! Contact submitted! Looking forward to speaking with you too! Eileen, thank you!!! Hope you are having a fabulous trip!! Kelleynan!! Your home is beautiful. Whenever you return to good ol Roanoke, let me know. I would love to have you come by and give me some pointers 🙂 Hugs from VA. Ashley!! Thank you so much! And thank you for stopping by. Absolutely 😉 I hope all is well- hugs back from GA.
Hi, i really enjoyed you fall home! I also live in Georgia and it was nice seeing a local home not to mention I want my future home to have the exact same floor plan as yours. You have impeccable taste that I adore. Such inspiration! Where did you get your dining room table/ chairs as well as the kitchen bar stools? I love seeing local homes too! So kind of you to visit- thank you so much for your kind words! 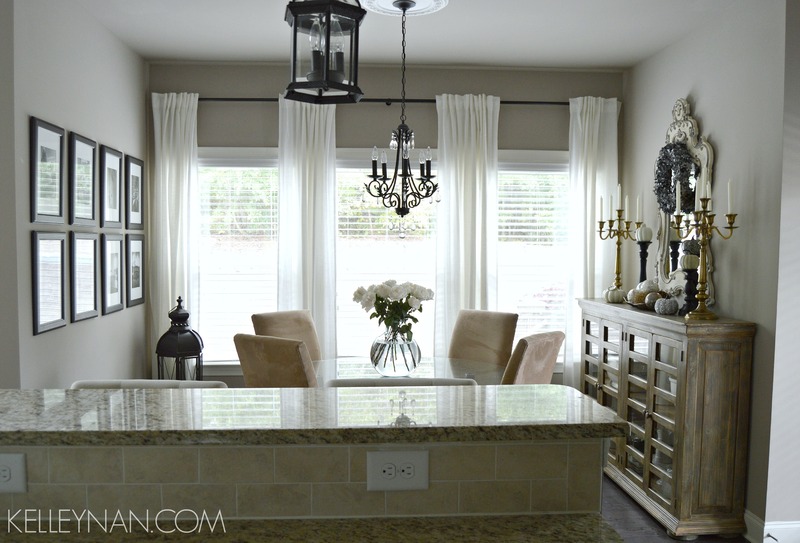 The table is from Restoration Hardware and the chairs and bar stools are from World Market- the Lydia. Your home is beautiful! 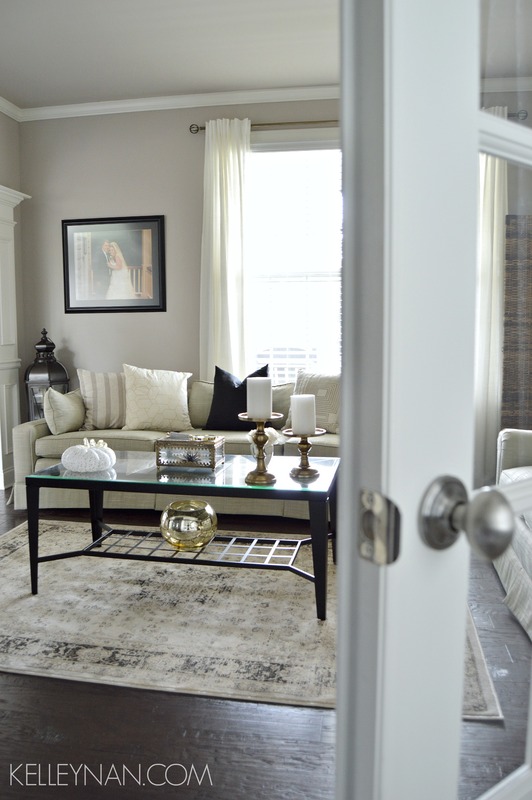 Where is your family room sectional from? I am currently shopping sectionals and this one looks like it would seat a lot of people. Thanks! Haha I love that wreath!! Sharon!! Thank you so much for your support! You are wonderful. So beautiful!! I could just step in your home and never want to leave! Absolutely beautiful! You have a great eye, Kelley! Haneen- I just adore you and your incredible style. Thank you for stopping by, my friend! Beautiful!!!!! I love everything about your home. Where did you find your pillows and throws in the great room? Also, what is your living room and great room wall color? We moved in our home last year and it’s still so blah as far as accents and decor. Plus our walls are still that builder grade Kilim Beige :(. Thank you in advance! Thank you so much and congratulations on your new home! 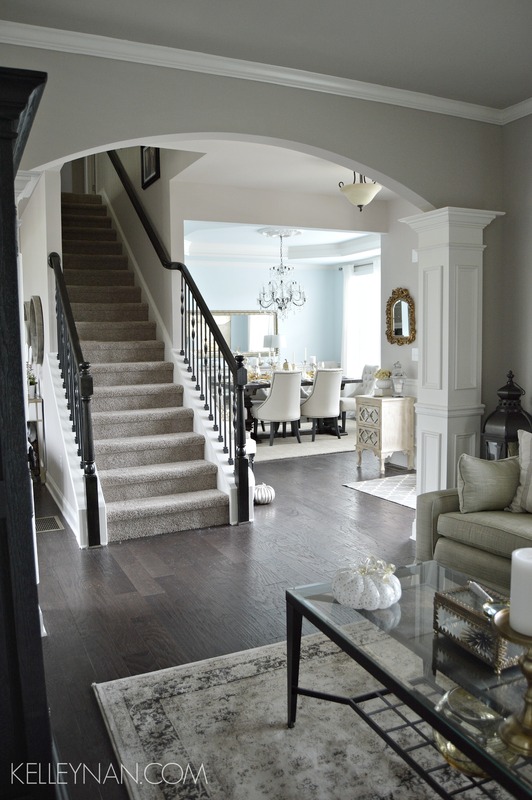 The color is Versatile Gray from Sherwin Williams. 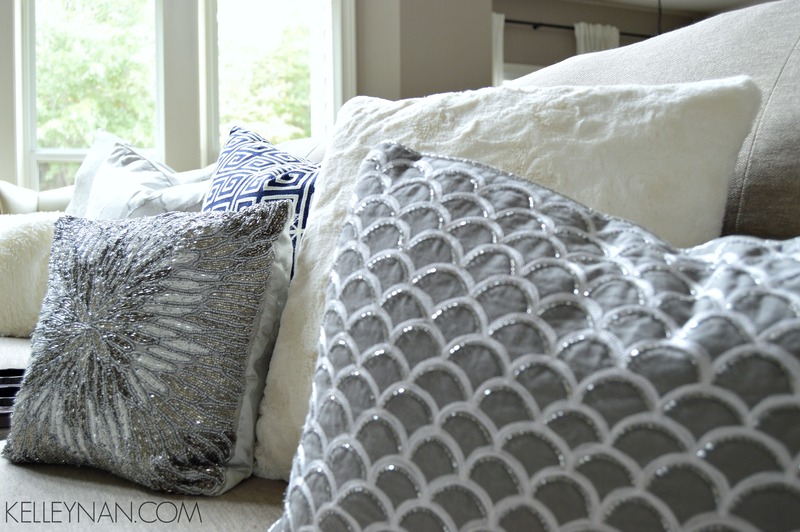 The pillows and throws are all from HomeGoods and Pier 1, except for the brown fur from Restoration Hardware. Your house is just beautiful. You are very talented. You truly are an inspiration. Keep with with your great work. Thank you for sharing. Thank you so much for visiting and for your encouraging words! 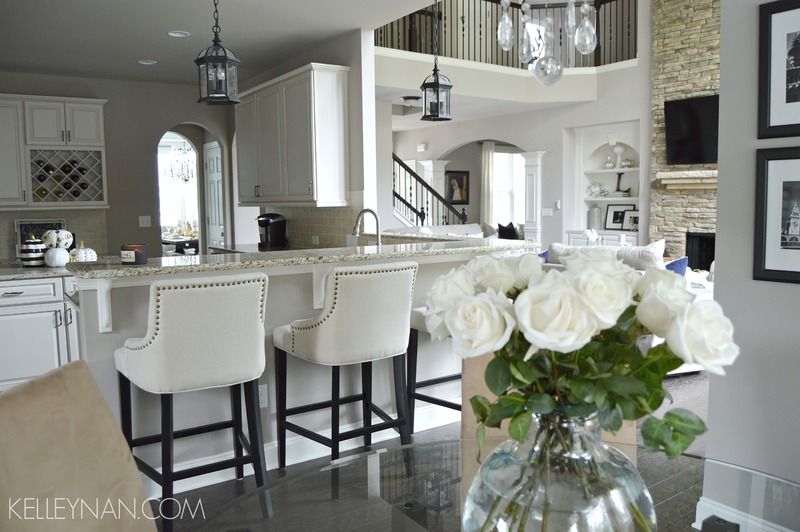 Stunning home and beautifully decorated! Thanks for the inspiration! Thank you so very much for stopping by!! Tana, thank you!! I am a huge fan of your work. Hoping one day I can enlist you to help me like you did Shauna! You have exquisite taste Kelley!! Everything is just lovely! I love your angles and composition in your photos!!! Perfecto!! Chris, thank you so much and thank you for visiting!! You are awesome, my friend! Kelley … Wow wow I love everything !!! 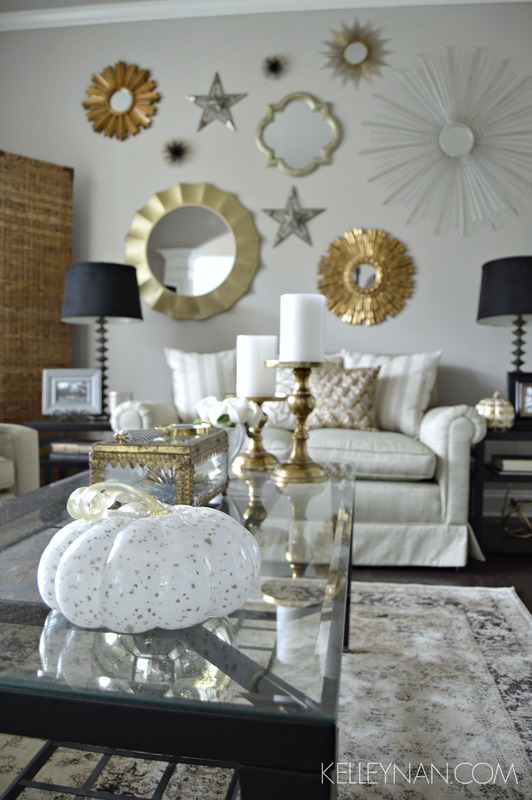 I am so inspired by your design of your beautiful home my friend!! It’s beyond gorgeous and perfect. Congrats my friend!!! Your taste and eye for design is the best I have seen since my search began. I have sent you an email about my interest in e-design for my home by you. Please reply. Tiesha, thank you so much for that incredible compliment and for taking the time to stop by! I am so humbled, truly. My sincerest apologies- I have been in the process of changing blog servers and moving my site and domain so the email may have gotten lost in the mix. If you can shoot me an email directly, I would love to chat! kelleynan8@gmail.com Thank you again and I look forward to hearing from you! Oh my! Everything is absolutely fabulous! 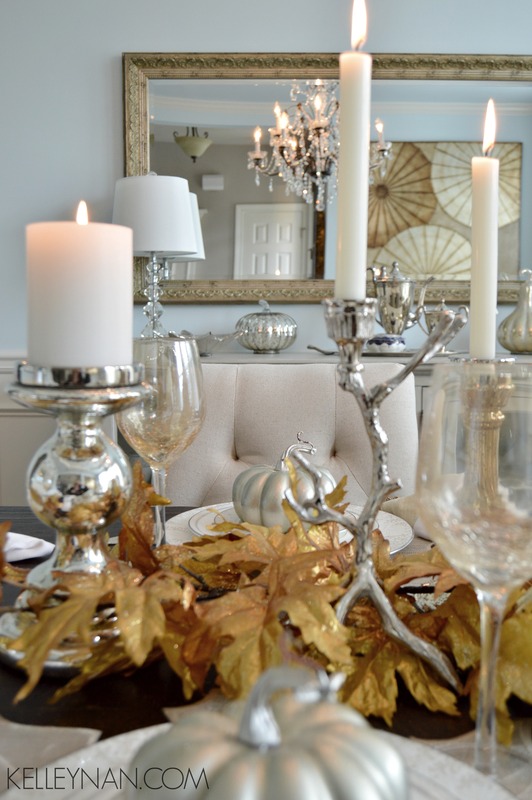 Who knew the neutral colors you have embraced speak to the epitome of the Season. I can’t wait to see more and thank you for inspiring me. MN, thank you so much for taking time to read and for inspiring me every day throughout my life. We are all about embracing those seasons!! I just love your home! You are a home design inspiration <3 We are considering a move north so I've been doing a little research. It looks like you built a Wilson Parker home, is that correct? If so, what floor plan did you chose? Thank you so much! Actually, our builder was Sharpe Residential in Atlanta. 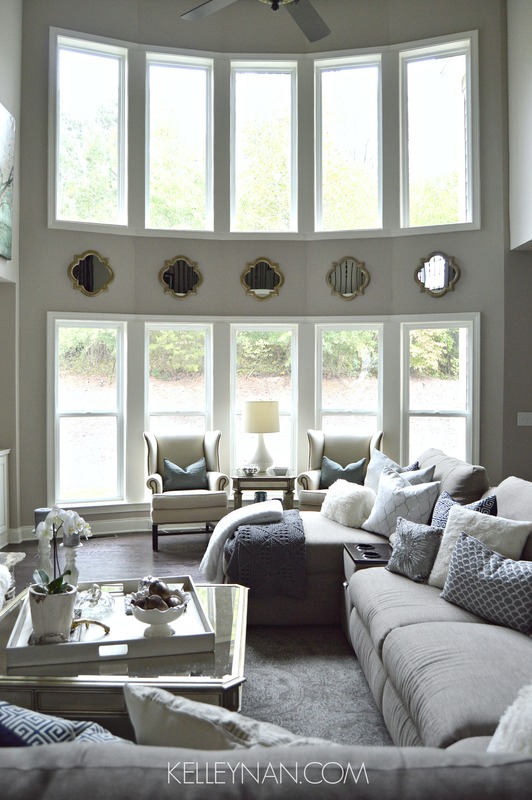 I’m a new follower and love how you’ve styled your house! I clicked on the link on how you decorated your dining table but it isn’t working. Thank you so much and thank you for following along! I’m sorry to here that. This link should work. Thank you so much! It is one of our favorite features, letting all that light in. I would absolutely love to and appreciate your kind comments! Your home is lovely. I just stumbled across it on Pinterest. I am wanting to do something similar in my dining room. Any chance you know the dimensions of your dining room and the size table you ordered from RH?? I want that same table :). Thank you! Hi, Kristin! Thank you so much for stopping by! I will have to measure as I do not know off the top of my head. The table does come with two leaf extensions so that helps also. I will get back to you! Kelley, I’m dying over your website!! Your house is absolutely gorgeous! Well done!! Oh my goodness, Kim! Thank you so very much for stopping by, your kind words, and your support. You are so sweet! Have a wonderful evening! Beautiful, tailored and chic! And gorgeous textures!! I love your style, Kelley. So glad we’ve connected on IG. Enjoyed seeing more of your home here. Loi, thank you so much! You are such an inspiration and I am so glad we have connected also! Would you mind telling me where you found the silver/blue rug that is inside of your front door? It has the trellis pattern. 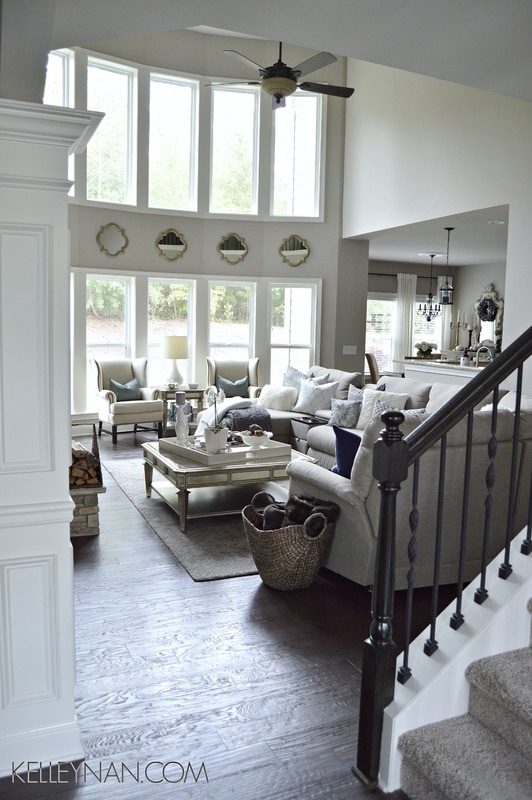 I’ve been hunting for a rug just like that for my entry way and as a runner for my hallway. I would really appreciate it, thank you so much! PS- Can’t wait too see your Christmas home tour! Alison, thank you so much!! The rug at the front door came from World Market. Thank you again for “being here”! Thank you so much for sharing! You are so inspiring, taking the time to reflect on the changing seasons, taking amazing photographs and the time to write an explanation of your process! Rachael, thank you so very much for visiting! Sharon, what an incredibly kind thing to say!! Thank you!! Where did you get the sideboard (off-white one)? Your entire home is beautiful, but I especially love the stone on your fireplace, can you tell me what it is? Kristy, thank you so much! Unfortunately, I don’t know- I quickly picked it from a lineup… I’m so sorry! 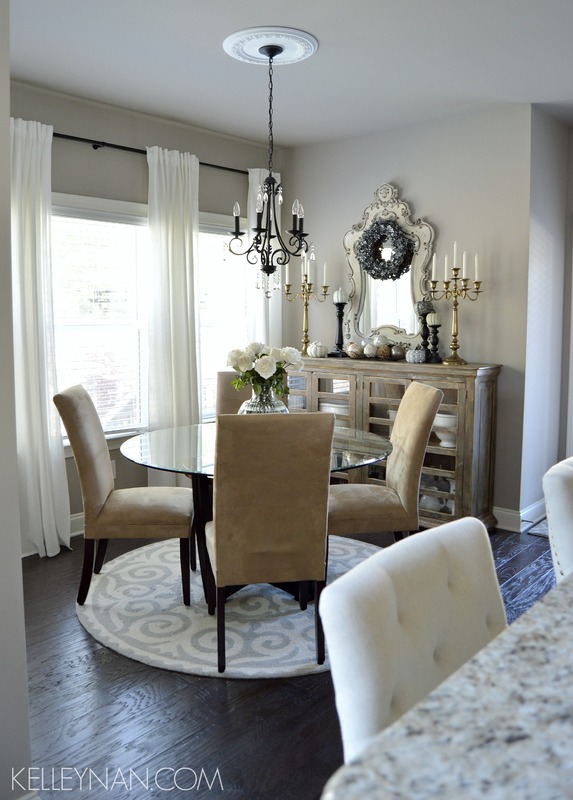 Can you share the dimensions of the rug in your dining room? Hi Kelley! I loved your home colors so much that I decided to test them out in my home. I LOVE the Versatile Grey!!! It looks great tested on the walls in our living/family room, foyer, small downstairs hallway and breakfast nook. I wanted to use a slightly different and complimenting color in the kitchen so I tried Perfect Greige. It looks horrible! My kitchen counters and backsplash are identical to yours, but our cabinets are espresso (dark brown like our floors) and the PG makes the kitchen look really dark. Do you have a suggestion for a shade that would compliment the VG that I can test? We have an open floor plan and I’d hate to mess up with ill matching or too dark colors! Our painters are coming first thing Tuesday morning and I need to give them final colors on Monday. Any feedback would be appreciated. Also, did you paint you ceilings or did you leave them white? Hi, Nia! I am so glad you like the Versatile Gray, but yes, if you have dark cabinets, I see how the PG could be dark. 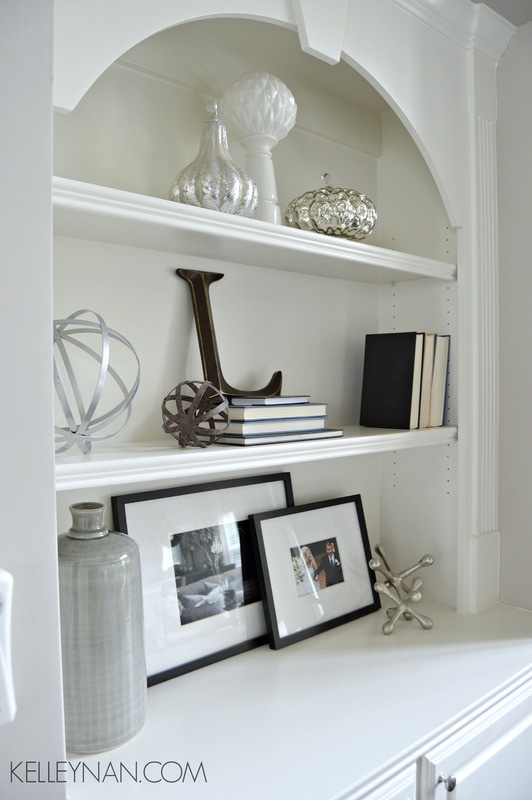 If you are sticking with Sherwin Williams, have you checked out Agreeable Gray? Or Heron Plume? My ceilings are the same as my wall colors. 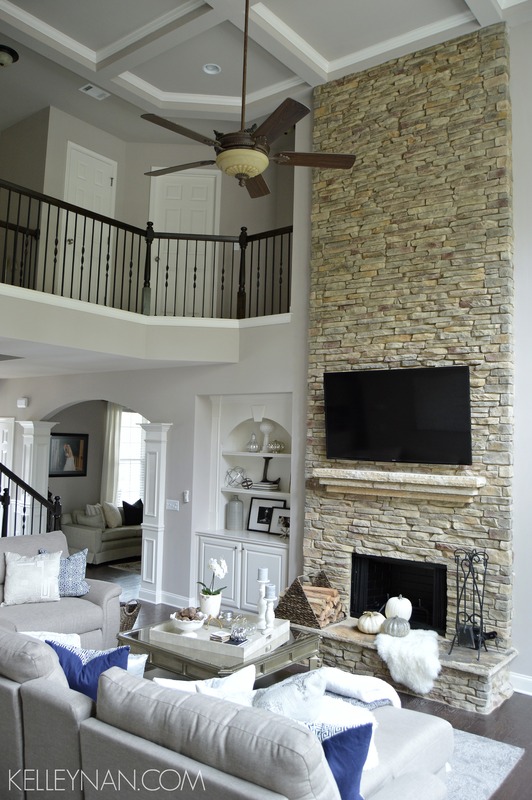 I am curious what brand & profile of stone veneer you used on the accent wall? Looks great. Hi, Carlton. Thank you so much for stopping in and taking the time to comment! Unfortunately, I do not know… I basically picked it out of a lineup and at that time, didn’t think to get details on some of these important things. I am so sorry! Hi Kelley! I am trying to find the perfect cream color to paint my kitchen cabinets. Yours look gorgeous. What is the name of the color? Hi, Jen! I am so sorry; I don’t know. I picked it out of a lineup. Ahh! 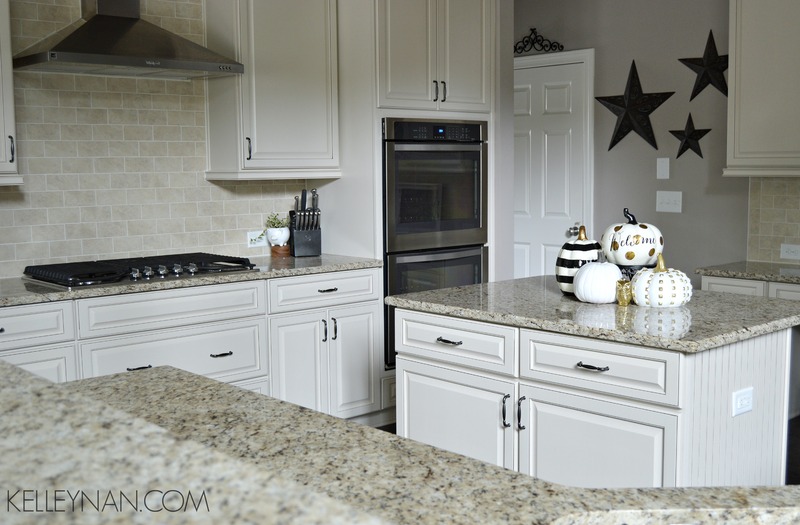 Best of luck choosing your color and your kitchen re-vamp! I just discovered this post today and there is not ONE thing I don’t like about your home. I hope living there brings you and your family as much joy as it brings to those who look at it. I have one question – where did you get the rug in your living room? I’m not very good at picking out rugs and I’ve been looking for one just like that for a bedroom…..
Anne, wow! Thank you so very much for your incredibly kind words! I found that one at HomeGoods – I usually check there first, but RugsUSA.com is also a great source. I love rugs that are tone on tone if they have pattern. Hi Kelley. I am a regular on your blog and insta. First time I comment. 🙂 I know I read it somewhere before but could you please tell me where you sectional came from? BY THE WAY your home is absolutely beautiful! Thank you!! Maya, thank you so much for visiting and for taking the time to comment! The sectional is from La-Z-Boy (the Aspen collection). If you go that route, I would suggest going in-store. Their fabric choices are endless and you can choose from a lot of different configurations! Very nice home. Moving to GA soon and looking to model our home after yours somewhat. What type of floors are those? Amazing work! Thank you so much! They are Nottaway Hickory in Weathered Saddle. Where did you get the mirrors which are under the windows??? 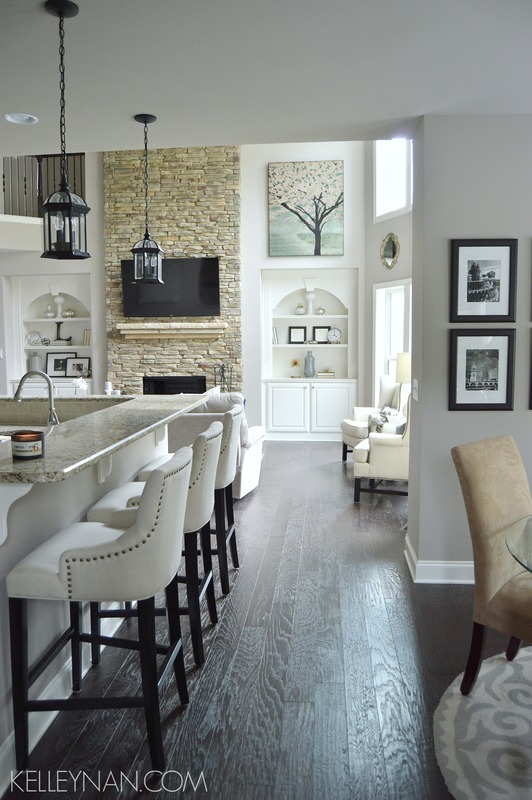 I did a quick search for bar stools on Pinterest in hopes of finding something similar to stools I saw in a picture done by my home’s builder…and found you have the exact ones I am looking for! Your home is gorgeous! Where did you buy your beautiful bar stools? Love the square coffee table in your family room. Beautifully staged. Where did you get the coffee table? Kelly I love your style! It’s very similar to my own and our homes have some similar elements to them. My husband and I are going to upgrade our floors. We are debating between engineered and a high end laminate wood type floor. The more expensive would raise the project $6000. What would you do? Can you really get away with a good laminate??? I know of people who have done laminate and love them. I am not a flooring expert but I would suggest researching the life, wear, and tear between the two if the look is really close. Good luck! Kelly! I love your home 🙂 Where is you couch from in your family room?? I loved every room in your house!!! From the outside all the way to that gorgeous dining room!! Beautiful tour! Kelly I love all your posts! Your home is beautiful! It feels so inviting and peaceful! Nisha, thank you so much!! 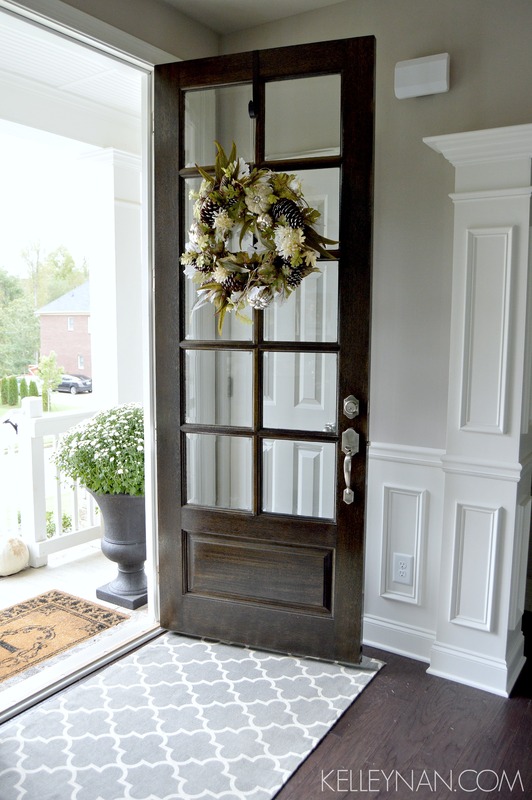 Did you see that my 2016 fall home tour just launched this morning? Hi! Can you tell me what color/brand is the stain on your front door and banister? Looking to re-stain banister and door and love the color. Thanks! Hi, Dee Dee! I’m not sure I still have any stain left from the builders (we chose it out of a lineup but didn’t pay attention to color as they just tried to match our floors) :/ If I come across it, I will let you know! love your home! Gorgeous!! What kind of flooring do you have throughout the house? We have dark engineered hardwoods that constantly have footprints and look dirty – yours have a more “roughened” look without a shine, which I think is causing my problem…. any info would be appreciated! Thanks again for the home tour! Julie, thank you! Ours are engineered too- Nottaway Hickory in Weathered Saddle. They are textured so it definitely helps! 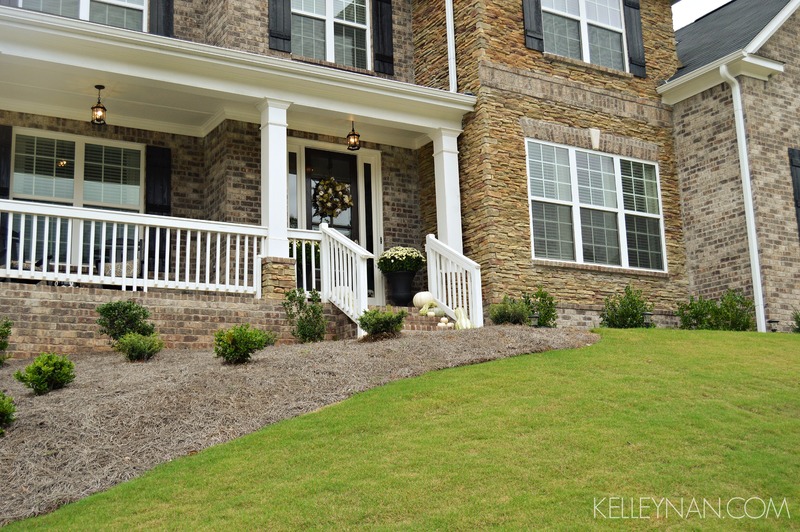 First off just let me say… I absolutely LOVE your home and style!! Gorgeous!! We just moved to GA from NYC and will be closing on our home in just about three weeks. My husband loves the big poofy recliners, I however, can’t stand them. 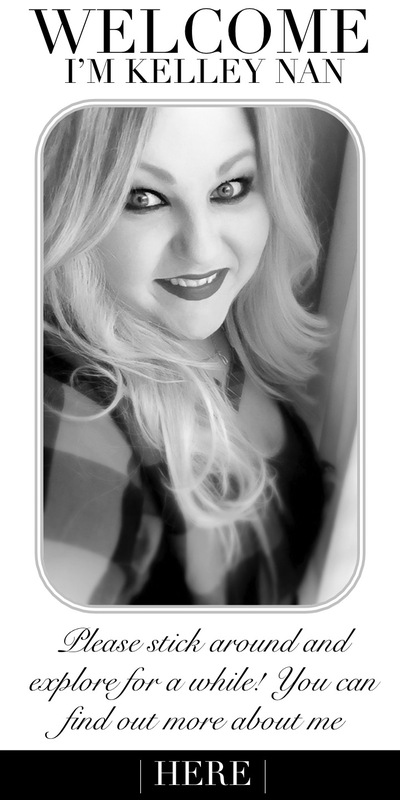 So I have decided to “compromise” lol, I pick it out! So, for the big question, is that a reclining sectional in your great room? If so, can you please tell me who sells it? 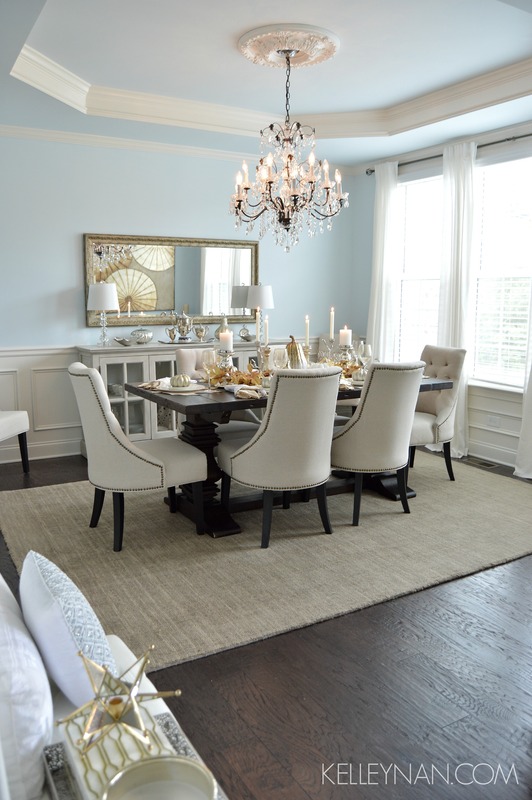 I love the contrast of the crisp blue in your dining room. Can you tell me the color? Hi Kelley Nan! I love everything about your home! I especially like the layout. Do you have pictures or a link to your Floorplan? We want to build a home next year and I’m looking for a great Floorplan with a 2 story living room. Hi, Janelle! I have some snapshots from when I very first started the blog casually here: http://kelleynan.com/house-hunters-small-town-georgia-edition/ I hope this helps! Hey there! Beautiful home you’ve created. 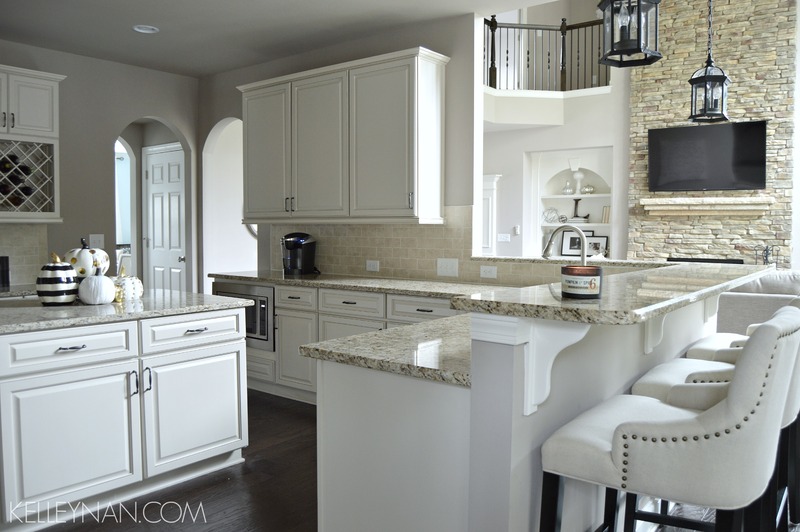 What color are the kitchen cabinets? Lea, thank you! I’m not sure as I picked them out of a lineup from the builder; I’m so sorry!